Sala Baï is wholly aligned with the PATA Foundation’s mission to contribute to the sustainable and responsible development of travel and tourism in Cambodia through supporting the education and employment of underprivileged people in Siem Reap. The school is delivering constantly well-trained students to the Cambodian tourism industry. The PATA Foundation has awarded the grant to the Sala Bai Hotel and Restaurant School for the specific purpose of providing essential support to an outstanding student. The school, in turn, has selected Miss Enh Hol (aged 20 years) as the recipient of this important award. The school will monitor closely Miss Enh Hol’s progress once she enters the workplace and will work with the PATA Foundation in assessing the value and benefits of such support. Miss Enh HOL was born on Friday the 4th of April 1995 in a little village named Bantaot Bos, in Banteay Meanchey province. The family home is a simple leaf house on the ground. Enh studied until grade 12 and applied to Sala Bai during her last year at school before her graduation. Her father is 43 years old and her mother is 41 years old. They are now both illegal workers in Thailand, along with her two sisters. Her father is suffering from typhoid so he sometimes goes back to his home village to get treated. The family only owns a small land of one acre of rice field, that is not enough to survive, that is why her family decided to go to Thailand to work as construction workers and earns more revenues. 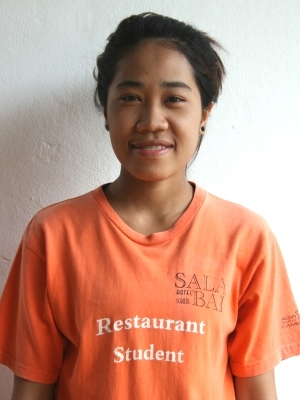 She has started her vocational training at Sala Bai Hotel School on the 2nd of September 2015 in the Restaurant section. Sala Baï Hotel & Restaurant School was founded in 2002 by the French NGO Agir pour le Cambodge. The school is entirely and exclusively meant for young Cambodians coming from underprivileged families. 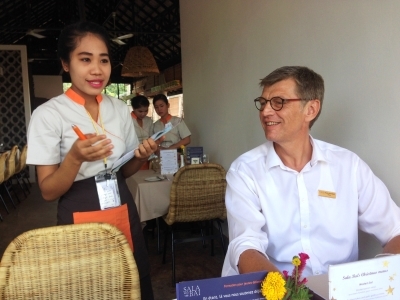 Each year, the school, trains 100 young disadvantaged Cambodians to the four main professions of the hospitality industry: restaurant waiter/waitress, cook, receptionist & housekeeping attendants. During the 12-month training, the school covers all the training fees (lessons, school supplies, books, uniforms), and daily expenses (accommodations, food, bicycle, insurance and medical expenses) for the students. The training lasts 11 months from September to July. The 12th month, August, is dedicated to assist the students to find their first employment. What makes Sala Baï so unique is the support of its network of partner hotels and restaurants that provides internship and job opportunities for the students. They are key to the success of the program and in ensuring that the students obtain long term employment after their graduation. In addition to the PATA Foundation; the school receives financial support from various other organisations and the local Cambodian government.